Stud Earrings. Solitaire Rings. Solitaire Rings with Accents. Scintillation is flashes of color that are viewable as an observer moves a diamond back and forth. Round Brilliant. Dangling Earrings. Diamond Ring Sets. Pave Diamond Bangle. Polki Diamond Bangle. Diamond Wedding Bangle. Designer Gemstone Earrings. Pave Diamond Bead Ball. Rose Cut Diamond Bead. Carved Gemstone Pendant. Wide Cuff Bangle. Round Brilliant. Loose Diamonds. Color Enhanced. You are looking at a stunning 4.31 total karat weight, Diamonds, Round Brilliant shape. The diamond is SI2 in clarity and G in color, making for a simply amazing piece of jewelry. W/ EGL USA certs/UGS appraisals, $23,270 diamond value! You are Purchasing a 14K White Gold 2 ct Round Brilliant Cut Diamond Stud Earrings. The earrings weighs 1.6 grams. Both diamonds are inscribed with GIA report numbers "GIA 3255376 " & "GIA 1237703 ". Gold Purity : 14k (58.5%) Pure Hallmarked Gold. Total Diamond Shape : Round. Total Diamond Color : I/J. About Total Diamond. Total Diamond ctw : 2.32ctw. Total Diamond Clarity : SI2. These stunning 4.00 TCW (total carat weight) diamond stud earrings feature a 2.00 ct round diamond on each side. The diamonds are rated SI2 in clarity, H in color, and securely mounted in 14k white gold setting, making for a simply amazing piece of jewelry. Act now to own a classic yet gorgeous design that will draw compliments wherever you go! We stand behind our product. Along with these earrings we will provide you with an appraisal document containing a detailed grading report on the diamond. Your satisfaction is our priority. Solitaire Rings. A mild solution of warm soapy water is an excellent way to freshen up your clarity enhanced diamond. Allow your jewelry to sit in the solution for about ten minutes. Rinse after you’ve given your jewelry a thorough cleaning making sure you reach the underside of the diamond in its mounting. Stud Earrings. Solitaire Rings. Solitaire Rings with Accents. Scintillation is flashes of color that are viewable as an observer moves a diamond back and forth. You are looking at a stunning 3.95ct total carat weight, diamond stud earrings. These stunning 4.00 TCW (total carat weight) diamond stud earrings feature a 2.00 ct round diamond on each side. The diamonds are rated SI2 in clarity, H in color, and securely mounted in 14k yellow gold setting, making for a simply amazing piece of jewelry. Act now to own a classic yet gorgeous design that will draw compliments wherever you go! We stand behind our product. Along with these earrings we will provide you with an appraisal document containing a detailed grading report on the diamond. Your satisfaction is our priority. These stunning 2.00 TCW (total carat weight) diamond stud earrings feature a 1.00 ct round diamond on each side. The diamonds are rated SI2 in clarity, H in color, and securely mounted in 14k yellow gold setting, making for a simply amazing piece of jewelry. Act now to own a classic yet gorgeous design that will draw compliments wherever you go! We stand behind our product. Along with these earrings we will provide you with an appraisal document containing a detailed grading report on the diamond. Your satisfaction is our priority. Pave Diamond Bangle. Polki Diamond Bangle. Diamond Wedding Bangle. Designer Gemstone Earrings. Rose Cut Diamond Bead. Pave Diamond Bead Ball. Carved Gemstone Pendant. Wide Cuff Bangle. Flush mount Stud Classic. Natural Round, Full cut diamond stud earrings. I-color, SI-2 clarity. Stud Earrings. Solitaire Rings. Solitaire Rings with Accents. Scintillation is flashes of color that are viewable as an observer moves a diamond back and forth. Round Brilliant. Color Enhanced. You are looking at a stunning 4.19 total carat weight, Diamond stud earings ,Round Brilliant shape. These stunning 2.14 TCW (total carat weight) diamond stud earrings feature a 1.00 ct round diamond on each side. The diamonds are rated SI2 in clarity, H in color, and securely mounted in 14k yellow gold setting, making for a simply amazing piece of jewelry. Act now to own a classic yet gorgeous design that will draw compliments wherever you go! We stand behind our product. Along with these earrings we will provide you with an appraisal document containing a detailed grading report on the diamond. Your satisfaction is our priority. These stunning 4.14 TCW (total carat weight) diamond stud earrings feature a 2.00 ct round diamond on each side. The diamonds are rated SI2 in clarity, H in color, and securely mounted in 14k yellow gold setting, making for a simply amazing piece of jewelry. Act now to own a classic yet gorgeous design that will draw compliments wherever you go! We stand behind our product. Along with these earrings we will provide you with an appraisal document containing a detailed grading report on the diamond. Your satisfaction is our priority. These stunning 4.14 TCW (total carat weight) diamond stud earrings feature a 4.00 ct round diamond on each side. The diamonds are rated SI2 in clarity, H in color, and securely mounted in 14k white gold setting, making for a simply amazing piece of jewelry. Act now to own a classic yet gorgeous design that will draw compliments wherever you go! We stand behind our product. Along with these earrings we will provide you with an appraisal document containing a detailed grading report on the diamond. Your satisfaction is our priority. 3.02 ct total weight EGL USA certified J color SI2 clarity round 100% natural genuine non enhanced diamond stud earrings in solid 18k white gold push backs. Setting is solid 18k white gold 4 Prong basket Style push backs. Stud Earrings. Solitaire Rings. Solitaire Rings with Accents. Round Brilliant. Color Enhanced. Dangling Earrings. Diamond Ring Sets. These Elegant Diamond Stud earrings are made of 14K Yellow Gold and are set with 2.01CT Diamonds. 4.80 ct H/I SI2 round diamond solitaire studs 18k white gold. 100% Natural 2 Round Brilliant Diamonds 4.80 cts tw H/I Color SI2 Clarity, Not enhanced in any way. only one diamond pair at this price. 3.20ct Diamond and 18ct Yellow Gold Stud Earrings - Anique Circa 1900. 2.01 carats total I/J color, SI-2 clarity natural round brilliant ideal cut diamond stud earrings in solid 14k white gold push back mountings. We are featuring 2. 01 cts Natural Round Brilliant Diamond Stud Earrings. 2.08 carats total weight E color SI2 clarity natural round ideal cut diamond dangle double stud earrings in 18k white gold push back mounting. Setting is solid 14k White Gold 4 Prong basket Style, Screw Backs. 3.00 ctw G color SI2 clarity natural round ideal cut diamond dangle double stud earrings in 18k white gold push back mounting. Setting is solid 18k White Gold 4 Prong basket Style. These earrings consist of:. 2.5 ct total weight F color SI2 clarity round natural diamond solitaire 4 prong basket style stud earrings 14k white gold push backs. 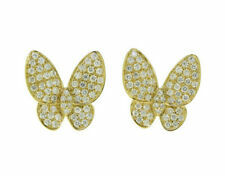 The stud earrings consist of only one diamond pair at this price. 2.14ct Diamond and 18k White Gold Stud Earrings - Contemporary Circa 2000. 2.00 ct total weight F color SI2 clarity round brilliant cut natural diamond solitaire 3 prong martini stud earrings 18k white gold push backs. Setting is solid 18k white gold 3 Prong Martini Style Push Backs. 4.07 ctw H SI2 round diamond flower earrings in solid 18k white gold. Center 1.00/1.02 cts each 2.02 cts total H SI2 round brilliant diamond. Side 2.05 ctw H SI2 round ideal cut diamonds. The Setting is solid 18k white Gold 13mm. 4.00 carats total weight G color SI-2/I-1 clarity natural round brilliant cut diamond stud earrings in solid 14k white gold. The studs consist of We are featuring 4.00 cts Natural Round Brilliant Diamond Stud Earrings. 3.45 ct total weight certified H/I color SI2 clarity round brilliant cut natural diamond solitaire 3 prong martini stud earrings 18k white gold push backs. Setting is solid 18k white gold 3 Prong Martini Style Push Backs.